Rent a Crane Fredericton | Home | Capital Crane Rentals Ltd.
Capital Crane Rentals is the preferred crane rental company in Fredericton and all of New Brunswick. Check out our selection and request a free estimate, today! Serving Fredericton and all of New Brunswick, Capital Crane Rentals is here for all your lifting needs. Manned by experienced operators,we offer rentals of cranes and boom trucks. Free estimates are always available — call us today to get started! Capital Crane Rentals often assists setting up of modular homes. Our service area includes all of New Brunswick, so if you have a project in mind, feel free to contact us at any time. Have an after-hours emergency? 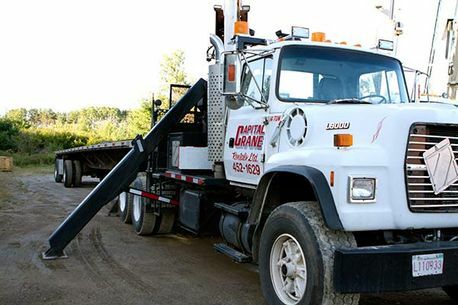 Capital Crane Rentals offers 24-hour emergency services to the Fredericton region. Give us a call today! Since November of 1995, Capital Crane Rentals has remained proud of our independent, locally-owned and operated status. We are fully insured. All operators are licensed, certified and covered by WorkSafe New Brunswick. Are you looking to transport machinery, equipment or supplies? Learn about the multitude of options available from Capital Crane Rentals. All equipment is modern and recently serviced. Call a representative of Capital Crane Rentals to discuss your crane, boom truck or flatbed rental needs, as well as receive a free, no-obligation quote.